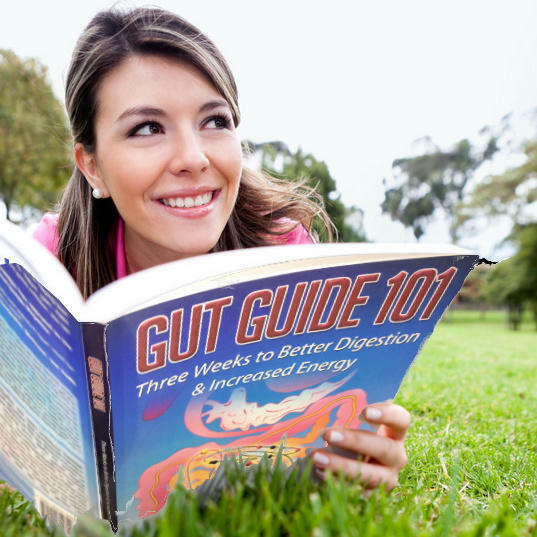 Here at Alive and Well, we offer the book that educations and helps you easily fix your Gut! Finally, a book on gut health that doesn’t make you give up your favorite foods. 70% of your immune system is in your gut. That means if your gut isn’t healthy, you aren’t healthy. With Gut Guide 101, you'll learn about the gut's crucial role in keeping you healthy - from boosting immunity and absorbing nutrients to getting rid of cancer-causing toxins. Plus, learn which daily habits may be damaging your balance of gut bacteria. Things like processed foods, high fructose corn syrup, antibiotics and high stress levels can all contribute to an unhealthy digestion. Don't mistake Gut Guide 101 for a fad diet or weight loss program. The 9-step, 21-Day Plan is easy to follow and you will not have to give up your favorite foods. Mari Hahn’s book is a moderate approach to healing the gut by adding in gut-friendly foods and supplements. Start with lemon juice in a glass of water first thing in the morning. This will set your digestive system on the right track for the rest of the day. Next, try the smoothie recipe, go for a walk or do the 10 minute yoga sequence included in the book. After 3 weeks of these simple additions to your routine, you’ll feel better than ever. We appreciate your interest in our courses. We'll let you know when courses are about to begin.